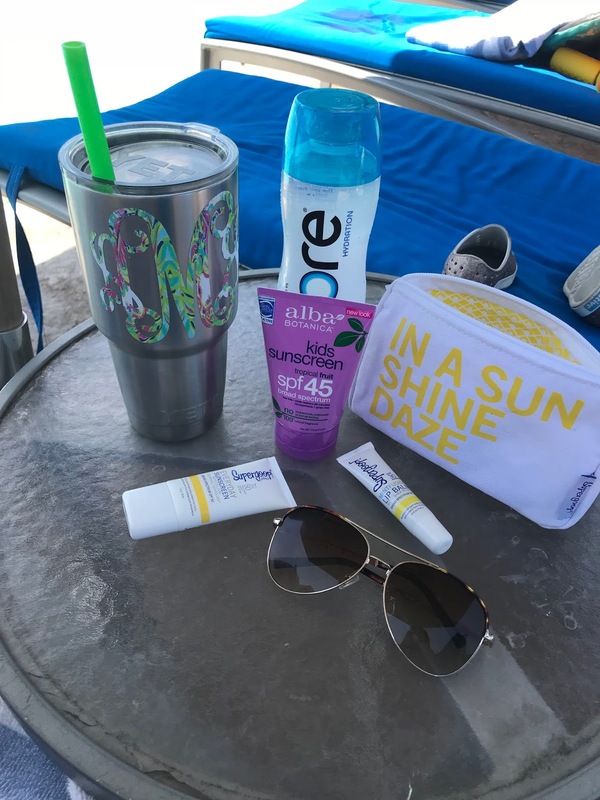 Today I'm sharing some of our Pool Favorites - things that we have been LOVING these past few weeks and things that we'll be using all summer long in and out of the water. Last summer I was ALL ABOUT the Trader Joe's spray sunscreen - and while I thought it provided really great protection, several people made me aware of some of the chemicals in it and my kids HATED me using the spray on their faces (yes, I sprayed it into my hands first) so this year I decided to try out a couple of new products and we are in LOVE. The first thing I did was switch to a rub-in sunscreen vs a spray. Yes, it takes a little bit longer but I know that they're all covered and the Supergoop we've been using isn't greasy at all. (it's available from Nordstrom HERE and from Amazon HERE). I also bought this Supergoop set (it comes with the sun shine daze bag) and inside are 2 bottles of rub-in sunscreen, a bottle of their spray and an SPF 30 lip balm and I keep it in my purse for when we're out and about and end up somewhere where the kids or I need sunscreen (like when we were at the Perot last week and they wanted to play in the water after the museum). 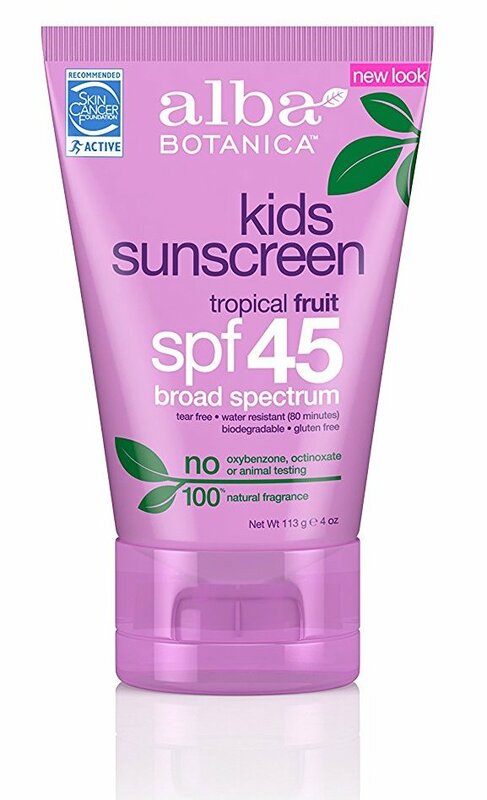 My other favorite sunscreen is the Kids sunscreen by Alba Botanica. What drew me to it is that it's tear-free but it's been amazing for their faces. I have used it all over as well - it's not greasy at all either. A note about sunscreen - we're in the water A LOT and I am a total stickler for reapplying every 90 mins and then making them wait 10 minutes before they get back in the water. Is it annoying? Totally. But it's a non-negotiable with us and the kids are all typically pretty compliant. When we're home they'll usually get reapplied and then go jump on the trampoline or have a snack or something before getting back in the water and their waiting time goes by pretty quickly. I was so excited when I found Splash Swim Goggles this year - they have a soft stretchy band instead of the regular rubbery one and I haven't had to adjust or "fix" goggles ONCE this year! ... and you can get 15% off when you use the code MOMFESSIONALS. Also, make sure you head over to my Instagram today because I'll be giving a pair away! 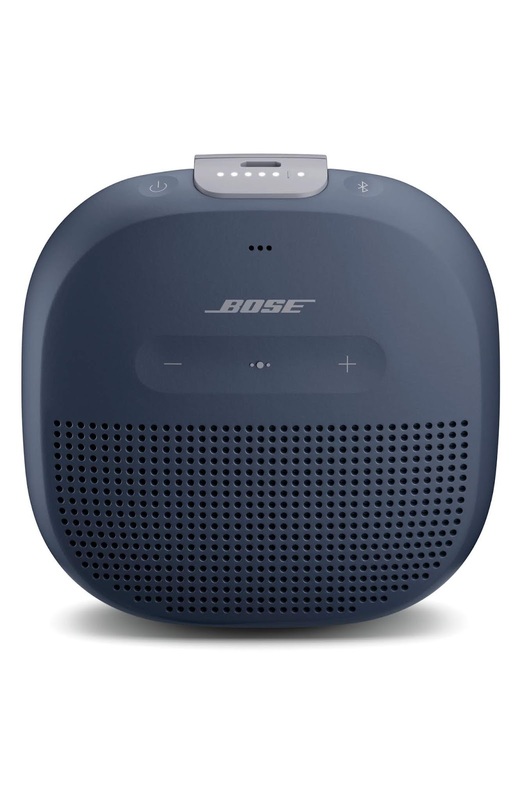 This version is about half the price AND is completely waterproof. Perfect for poolside, on the boat, etc., etc. .... and this year we're proud owners of the world's most patriotic pool float ;) Nothing says 'merica like a giant red, white and blue eagle, right??? have been a big hit as well. Last year I had this big wheeling net/basket thing for toys and it was just too big for how many toys we had. This year I grabbed this round patio box and it's been perfect. The lid comes off and it doubles as a little ottoman/coffee table on the gazebo. (we're all ignoring how badly our gazebo needs to be washed after all the rain last week). 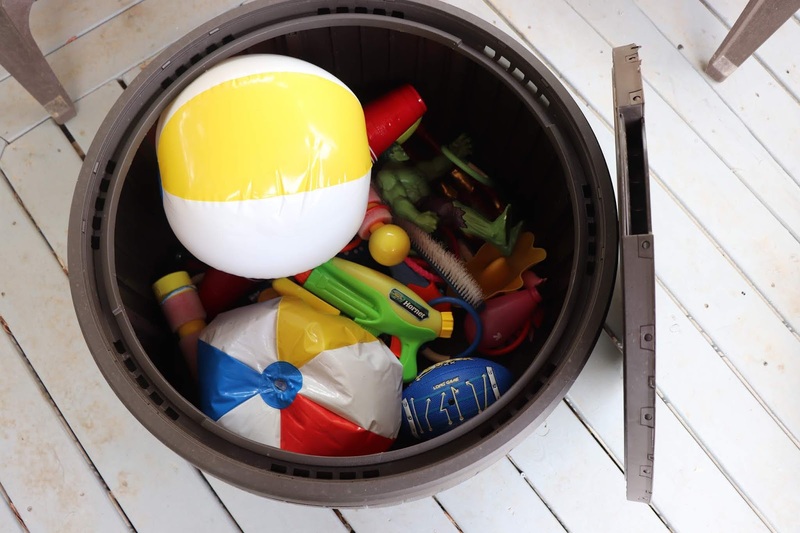 It's big enough to hold all of the toys and beachballs and cups and closes up at the end of the day so everything is put away and clean. One last poolside favorite has been this underwater camera. You can use it out of the water too, but the kids had the best time taking it in the water while we were in San Antonio a couple of weeks ago and at the $40 price point I didn't have to worry too much about it and it got some awesome video. It comes with a TON of accessories but you will need a microSD card and reader which you can get HERE for $10. What did we do before those big pool floats were such a hit? How’d we live without them? Ha! They’re the most popular item in our pool by far! Right?!?! They're my kids favorite too! This is probably a silly question, but where is the green straw you use in your Yeti from?!! I have a Yeti and am trying to find “the perfect” straw! Haha! Thanks! It's a bubba straw from Amazon! Thanks for the recs. We bought a new pool float last year, deflated it for the winter, and when we blew it up this year, it won't stay inflated. Evidently, it has a hole. Have you found that to be common? Should we only expect to get 1 summer out of a new pool float? This was our first year to have ours ruined over the winter so I don't really know! This year our plan is to store them in an airtight container in the attic - fingers crossed! We have a Keter deck box for our patio cushions and love it as well! Good to know! I actually have the supergoop mineral sunscreen as well! Thanks! oh my goodness those goggles look amazing! I just ordered 3 pairs for my grandchildren! Unfortunately, I'm an idiot and clicked over to see them and ordered right away (I hate messing with those rubber goggles!) and didn't see the code! darn! Lesson learned, be patient and read to the end before clicking purchase! Thanks for the tip! ha! I love all of your disclaimers about the sunscreen and the music. Everyone is a critic! We do have neighbors on either side of us that are pretty close but no one behind us but we still play our speaker (sometimes kind of loud!) when we are swimming. I figure that is what you sign on for when you move into a neighborhood with small lot lines. But we don't ever do it at late hours. Those swim goggles look awesome!!! We have had several of the big flamingo, duck, etc floats but I gave up them. As fun as they are, they take up like half of our pool and always get popped within a few weeks. Ah, the life of middle school boys! Kasi - your pool float comment is cracking me up! They should make floats specifically for middle schoolers! If you don't have one yet, check out the Super SHarkpedo pool toy. Our friends have them. The big boys love them! Thanks for the recommendation! Looking at them now! That camera looks awesome! I love the googles, too. Don't apologize for being a stickler with sunscreen...that's a good thing! Love these recommendations! We live in Florida and are currently having a pool built in our backyard. Can’t wait to use it! Does that patio box drain water? Like if wet pool toys get thrown in, will they be able to dry out? I was going to order the camera yesterday, but after reading the reviews I noticed a lot of people complain about a very short battery life. How long does yours usually last before you have to recharge? Thanks!